Solar Voyager: How to Display Your Work - PLEASE READ! How to Display Your Work - PLEASE READ! Welcome to the Member's Gallery area! This is the place to display finished artwork for other members to evaluate and offer comments, suggestions, etc. Works in progress, individual elements of space art (spacecraft, nebulae, etc.) should be posted to the "Works In Progress" forum. If you have a question about a specific tool or technique, please post that in the "Digital Creations" forum. You must have a registered User ID to post images (free of course). 1.) When you create a new topic here, the Subject line should include your display name and the title of the image. You may open topics as needed (individual topics for each image are encouraged). This area is not for general conversation. Topics that are not gallery pages will be removed. 2) Each new topic must include an image of your finished artwork. Images can be any resolution but cannot exceed 500KB in size. 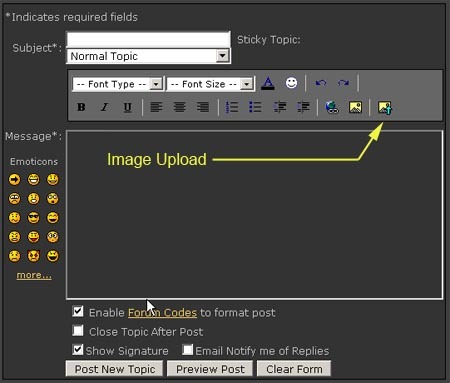 When you upload your image, the forum software automatically creates a smaller, "preview" image that is displayed in the message, along with a link to the full-size image. 3) At present, the Safari browser does not work properly for image upload. Please use Internet Explorer or Firefox, which have been tested and work properly. Create a new topic normally, then position your cursor in the post where you want the preview image to appear. Click on the "Image Upload" button. Go ahead and choose "Browse" to find the file on your local computer. Once you find the file, select it and click the "Upload" button. Once you hit "Ok", the file browser window will disappear and you will see your preview image in the body of the message. Like the sign says, be patient. Depending on your connection speed, it may take several seconds. If you see an error, it may mean the file doesn't exist on your local drive or the path is wrong. Once the upload process is finished, you will have the preview image and links to the full-size image in your message. They won't be clickable until you actually post the message though, so keep that in mind! That's it, have fun! Everyone likes to receive input on the work they have spent so much time creating...this should help us all to grow as artists and improve! Ready to get started? You can add an image right away by clicking HERE. Remember, you must have a registered user account before you can post, so if you haven't done that yet, take a look at the registration link.